The next time you order Thai Red Curry or a cold Chinese salad, ask for a German or Belgian wheat beer instead of a glass of wine. It’s 8 p.m. on a Saturday and as I order my favourite Thai Red Curry and Prawns at 19 Orient Avenue, the Oriental restaurant inside Delhi’s Shangri-La Hotel, my dinner companion, a beer aficionado who, funnily enough, makes rum for a living, tells me to order a Witbieren or a Belgian wheat beer to go with the food. I am aghast as I think beer is something which goes well only with snacks or large chunks of grilled meat. But he insists, so I order a Hoegaarden. Forty-five minutes and a satisfying meal later, I have to admit he is right. 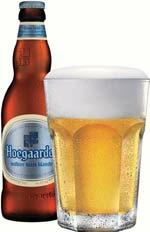 The Hoegaarden is easy on the palate and its mild fruity flavour complements the food well. Is this then what avowed beer drinkers call the Sauvignon Blanc of beers? I call up my neighbourhood wine shop in Greater Kailash the next morning and order half a crate. The shopkeeper knows my curiosity about all spirits new, so he sends my order along with two extra bottles of a German wheat beer called Erdinger that’s very popular as well. Several sips and one afternoon later, I am a convert. As I refrigerate the bottles, I promise myself that I’ll walk in the park later to work off the calories. There are broadly two varieties of wheat beer—there’s Witbieren or white beer, based on the Belgian tradition of adding flavour to the wheat and malt, and Weissbier, which is based on the German tradition of mixing at least 50 per cent wheat to barley malt to make a light coloured ale. Hoegaarden is the former—it has an intriguing fruity flavour that comes from spices such as coriander or bitter orange peel that are added to the malt. Pronounced ‘Hu-garden’, this is a beer as old—older actually —than the Mughal Empire. Brewed in the tiny village of Hoegaarden in the Brabant province of Belgium, the story goes that the local monks of the Begarden order began to use spices made available to them by the Indian spice route, to experiment with new beers. Hoegaarden was the result. It even comes with its own signature glass. The hexagonal chunky tumblerstyle glass is almost as popular as the beer itself, and, that too, has a story behind it. If legend is to be believed, the shape is such that the glass can be prised out of a tipsy customer’s hands with a spanner at the end of the night. Munich. It is brewed from wheat and barley malt using top-fermenting yeast— the kind of yeast, in other words, that rises to the surface during fermentation, creating a very thick, rich head and forms a white layer. This is why you won’t find the yeast at the bottom of the bottle here unlike in a Pilsener, which is a bottomfermenting beer. It makes for a beer with a lower proportion of hops and a higher proportion of carbon dioxide. So, the Erdinger is exceptionally refreshing and thirst-quenching. It perks me up enough to walk a couple of extra rounds in the park. I have to lose those extra calories if I am to attack the remaining bottles next weekend! Erdinger has two varietals in India— the Premium Weissbier, which at 5.3% volume, is a relatively light beer. A 330 ml bottle of the premium is available for Rs 100 in Delhi, Mumbai and Bangalore. The Dark Weissbier with a higher volume of 5.6% comes in a 500 ml bottle and is priced at Rs 130. of adding flavour to the wheat and malt, and Weissbier, which is based on the German tradition of mixing at least 50 per cent wheat to barley malt to make a light coloured ale. Hoegaarden is the former—it has an intriguing fruity flavour that comes from spices such as coriander or bitter orange peel that are added to the malt. Pronounced ‘Hu-garden’, this is a beer as old—older actually —than the Mughal Empire. Brewed in the tiny village of Hoegaarden in the Brabant province of Belgium, the story goes that the local monks of the Begarden order began to use spices made available to them by the Indian spice route, to experiment with new beers. Hoegaarden was the result. It even comes with its own signature glass. 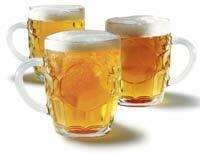 The hexagonal chunky tumblerstyle glass is almost as popular as the beer itself, and, that too, has a story behind it. If legend is to be believed, the shape is such that the glass can be prised out of a tipsy customer’s hands with a spanner at the end of the night. The following afternoon— purely to compare the might of the German beer makers with their tiny neighbours—I try the famed Erdinger Weissbier. (Yes, this is a long weekend we are talking about since my company doesn’t pay me to sit at home and guzzle beer.) Erdinger, Germany’s most famous wheat beer, comes from Erding, a small town in the heart of Bavaria, an hour’s drive from Munich. It is brewed from wheat and barley malt using top-fermenting yeast— the kind of yeast, in other words, that rises to the surface during fermentation, creating a very thick, rich head and forms a white layer. This is why you won’t find the yeast at the bottom of the bottle here unlike in a Pilsener, which is a bottomfermenting beer. It makes for a beer with a lower proportion of hops and a higher proportion of carbon dioxide. So, the Erdinger is exceptionally refreshing and thirst-quenching. It perks me up enough to walk a couple of extra rounds in the park. I have to lose those extra calories if I am to attack the remaining bottles next weekend! The DarkWeissbier with a higher volume of 5.6% comes in a 500 ml bottle and is priced at Rs 130. Hoegaarden is the mildest of the lot at 4.8% volume. It is available at all the metros and is priced between Rs 100 and Rs 140 for a 330 ml bottle depending on the city. All three beers are available at most liquor shops and at five-star hotels. These brands are not available in India yet, but whenever you are travelling abroad, try one of these if you love wheat beer. This German wheat beer has a sweet and sour aroma and tastes of mangoes, apples and a big flush of citrus. A fairly light-bodied drink. This is a smooth, slightly sweet wheat beer that’s a favourite in United Kingdom, with those who prefer their ale the wheat beer way. Beer: Produced in the Barrow Valley Region of Ireland— this is one of the few Irish wheat beers in a land of guinness. It’s darker in colour than most wheat beers.